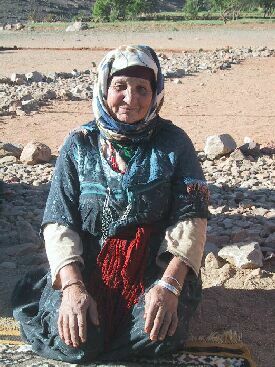 This is Sheeto the grandmother of Samira, the young woman in the green sweater who helped me so much. At first she didn't want her picture taken (I always ask permission), but I'm glad she did. You can see the warmth in her face, especially if you click on the photo. Behind her you can see a bit of green, an irrigated garden in this harsh, rocky environment. She made the rug below. 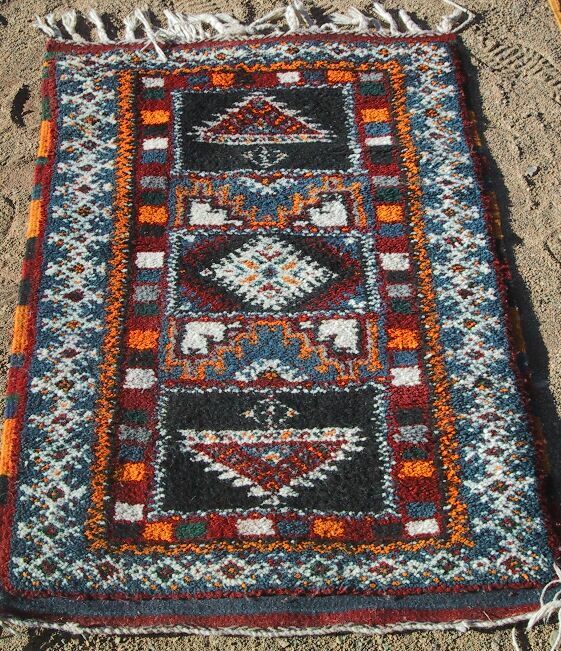 Piece 2.11426 was also made by Samira's grandmother. 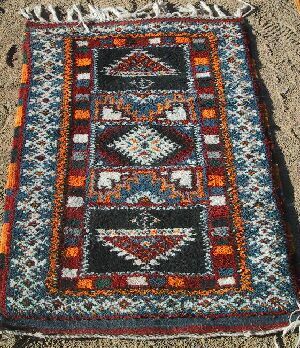 It's a small knotted rug in the Tazenakht style, in a deep red, grayed blue, gold and black. The large triangles in the black squares are called "takhalalt" in Berber, and they represent a piece of silver jewelry women use as a clasp on clothing; the Romans called them fibula. You can see the details better on the close up. It's about 2 x 3 1/2, measuring 2'1" x 3' 6". The price is $120. It is SOLD but can be remade. This is Rehma Aznug. 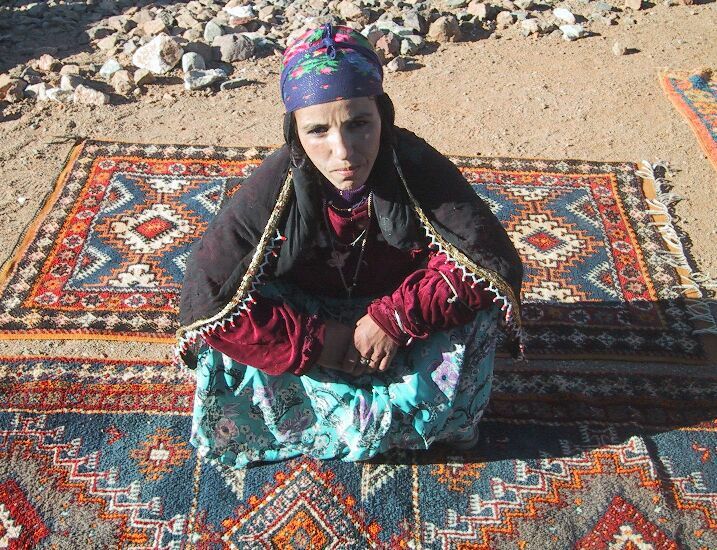 She made the rug below (and on which she is sitting here), working with her two sisters-in-law. She has two children, ages 5 and 7; another of her children died. In addition she cares for the seven children of her husband from a previous marriage. Her husband is a farmer, and with the drought, they need the women's earnings from weaving to pay household expenses. Piece 2.11418 has three central panels and soft colors. 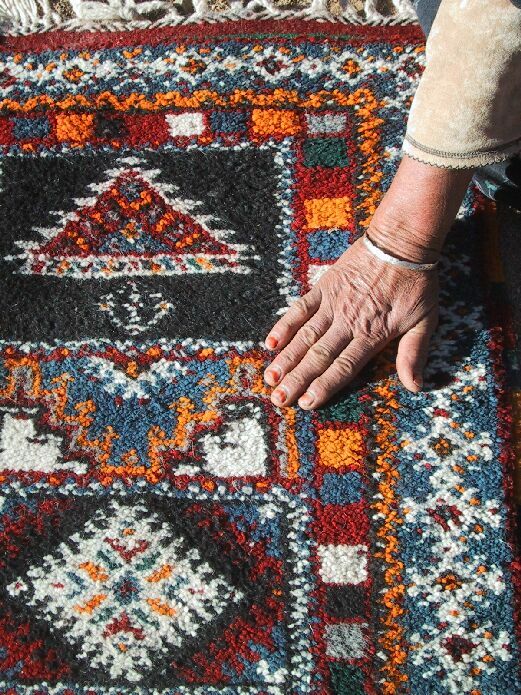 A main color is the dark blue ground with some abrash or color variation in it, valued by collectors as a sign of handmade rugs. You can see it best in the left panel of the rug if you click on the photo here. There is also gray in the diamond shapes, and a rich red and bright gold. You can see the intricate designs best on the close up. The size is 3'9" x 7' and the price is $525.